Erected by Elizabeth Sinclair of Forse in loving memory of her dear husband. 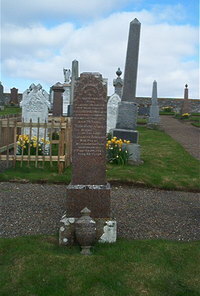 Alexander Sutherland of Janetstown Latheronwheel died 16th July 1910 aged 73. Wife Elizabeth Sinclair died at Melbourne Cottage Latheronwheel 2nd September 1925 aged 83.